Dr. Mainville adds quite a bit of sparkle to our offices! Always smiling, and always keeping her patients’ best interest in mind. Never one to shy away from a 30 second dance party, her natural enthusiasm fosters a fun, positive atmosphere amongst staff and patients alike! 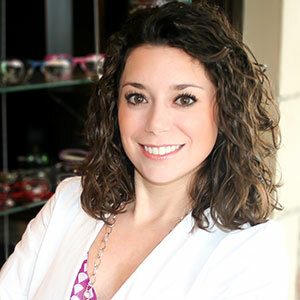 Nuvo is fortunate to have worked with Dr. Mainville even before her career as an Optometrist. She has truly helped cultivate and grow the positive reputation of Nuvo and has contributed greatly to the level of patient care we provide. • Completed her residency at a veteran’s hospital in the United States. Dr. Mainville’s professional interests include paediatric care, complete contact lens care, and diabetic eye care. Loves her morning coffee and chasing her two toddlers around. In that order.